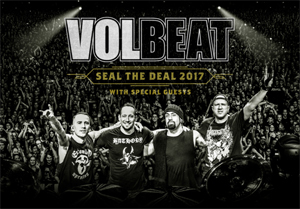 VOLBEAT has revealed plans to stage the band’s largest headline appearances to date. In August, 2017, the quartet will set out on this run with a vision of raising the bar to the next level, as they present a night to remember in these markets featuring a set list composed of repertoire they have never performed on stage, new material, and of course their hit tracks. Plans also include a range of surprise special guest appearances. The band has already begun creative discussions aimed to deliver a unique show with production that is their most ambitious to date. The tour will begin in Hamburg on 23 August, 2017 with multiple outdoor events planned in Germany, alongside performances in Denmark, Sweden, Norway, The Netherlands, Switzerland, and Austria. The pre-sale for all appearances cited below goes live on November 30 10AM via the band's Rebels and Angels fan club HERE. A general on-sale follows on December 1, at 10:00 AM.